No matter what your passion, there's a point at which you're likely to plateau. That may be OK; perhaps you've become proficient enough to accomplish everything you desire. But for those who are dedicated to continued improvement and have ambitions as coaches, expeditioners or higher-level paddlers, plateaus aren't acceptable. We aren't content to see our skills and knowledge top out. We want to become better paddlers. 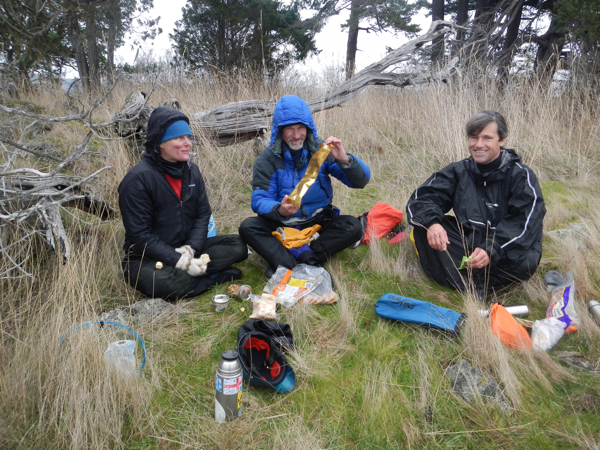 While we were on Orcas Island with Shawna Franklin and Leon Somme, we talked about the path to becoming an expert. It is, to paraphrase them, a function of hard work, deliberate practice, and guidance from a coach who offers constructive, honest feedback. They shared with us an 2007 article from the Harvard Business Review, "The Making of an Expert" by K. Anders Ericsson, Michael J. Prietula and Edward T. Cokely, which summarizes research supporting the idea that outstanding performance is not so much a function of innate talent as it is a product of methodical, challenging practice and thoughtful, critical coaching. Shawna challenges herself by surfing a wave while sitting on her deck. For higher-level coaches like Shawna and Leon, this means finding hard things to work on and seeking out mentors who point out their weaknesses, even when that type of feedback is uncomfortable. The same is true for all of us, no matter what our level. We'd often prefer to keep working on the skills we already have and hear others affirm our accomplishments. But that's not the path to improvement. 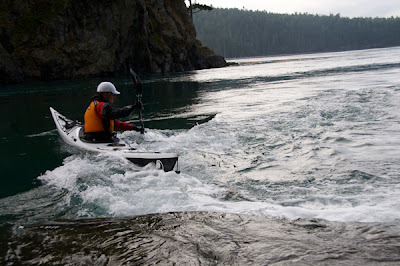 While we were at Deception Pass, we saw this approach in action. 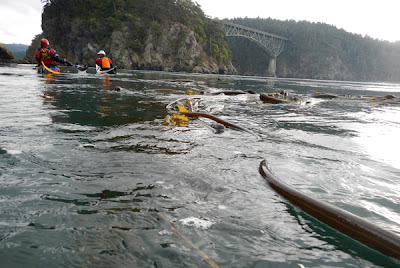 After allowing us to warm on an eddy line, they suggested we try increasingly challenging moves as we crossed over into the current: edging without bracing, exiting with a cross-deck rudder, returning to the eddy as quickly as possible, rolling and static bracing on the eddy line, and self and assisted rescues in the current and whirlpools. They gave different challenges to each of us, ratcheting up the difficulty as we demonstrated we were ready for more. 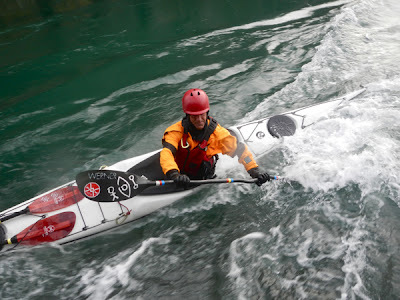 Seth exits an eddy with a cross-deck rudder. "Deliberate practice involves two kinds of learning: improving the skills you already have an improving the reach and range of your skills." "Genuine experts not only practice deliberately, but they also think deliberately...they continuously work to eliminate their weaknesses." "The development of expertise requires coaches who are capable of giving constructive, even painful feedback. Real experts are extremely motivated students who seek out such feedback." This is true for becoming a more skillful and knowledgeable paddler as well as becoming a better coach or guide. Improvement is less a matter of innate ability than it is about willingness to work hard, seek challenges, and accept and act on knowledgeable critiques. Alec and Sharon practicing deliberately. The Maiden of Deception Pass, after her transformation. 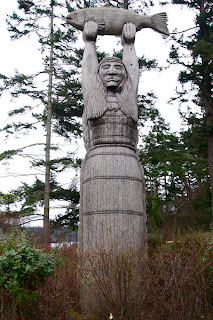 There's a Salish legend about the Maiden of Deception Pass, who encounters a handsome (though "damp and chilly") young man who lives in the depths of the ocean. Every time she goes to the shore, he reaches out and holds her hand. Long story short: After many such encounters (and disapproval from her family, which later yields), she agrees to move in with him. 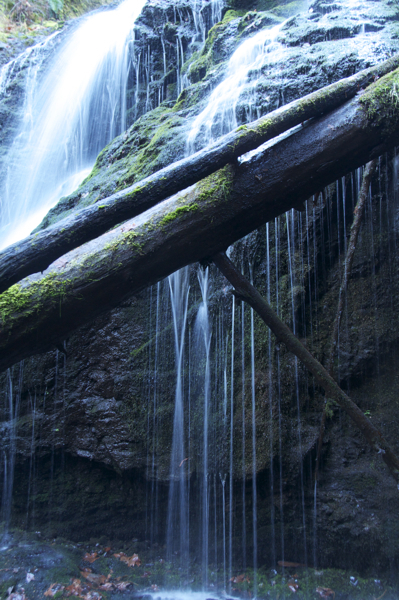 Every time we visit the Pacific Northwest, we feel likewise torn between our roots in the midwest and the many allures of this area. We are tugged by the beauty of the land, the profundity of the ocean, the phenomenal paddling opportunities, and our wonderful friends in the area. 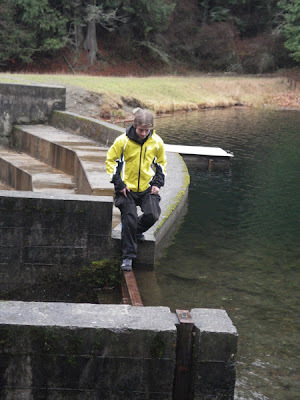 Jeremy on a hike around Mountain Lake in Moran State Park on Orcas Island. 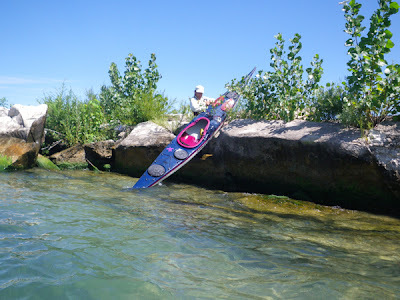 Lunch with Shawna and Leon during a day paddle through the Wasp Islands. Toto, we aren't in Chicago anymore. 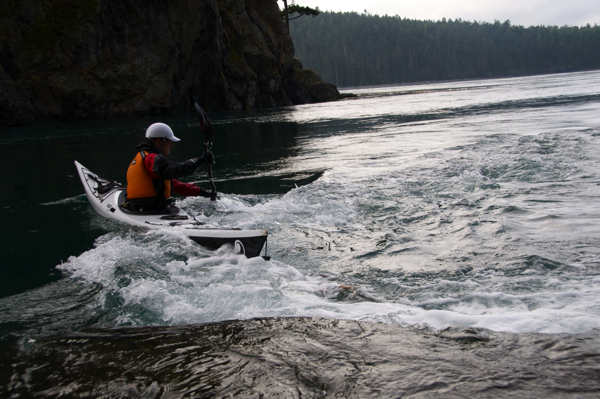 We're back at Body Boat Blade, on Orcas Island, Wash. with our friends Shawna Franklin and Leon Somme. 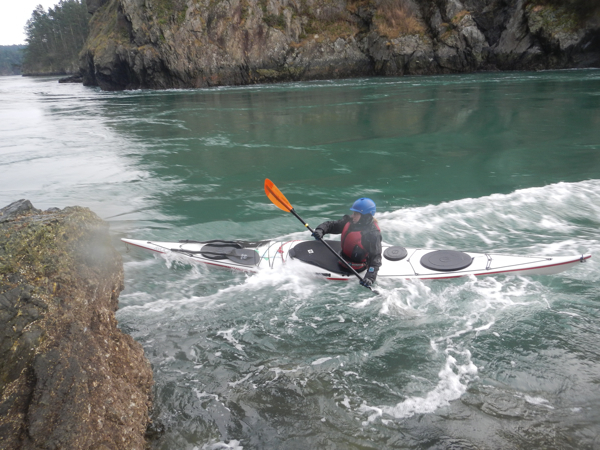 Shawna and Leon recently released a new Sea Kayak Rescues DVD, filmed by Bryan Smith, a dramatic and instructive guide to assisted- and self-rescues in flat, dynamic and rough water. Some of the filming was done in Deception Pass, a place we've long heard about and were looked forward to visiting. 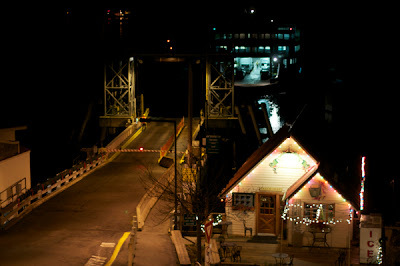 The Orcas Island ferry dock before dawn. Getting there meant catching the 6:45 a.m. ferry so that we could arrive during slack tide. The day's max ebb was going to be 7.1 knots at 1:08 p.m., and we wanted to have time to play in the building current before experiencing the full force of the ebb. Shawna and Seth paddling toward the bridge. 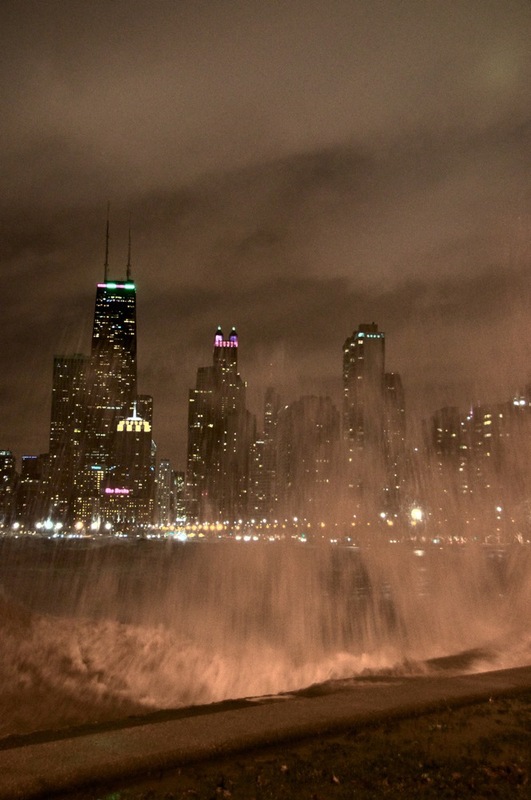 Compared to Chicago, the air and water were warm--both in the mid- to upper 40s. 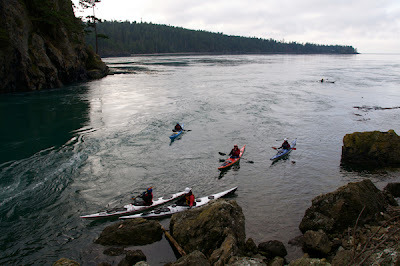 We paddled past cliffs and barnacle-covered rocks, noticing how the bull kelp indicated the direction of the current. We stopped in an eddy near the bridge, where the eddyline was growing stronger by the moment. The group arrives in the eddy. 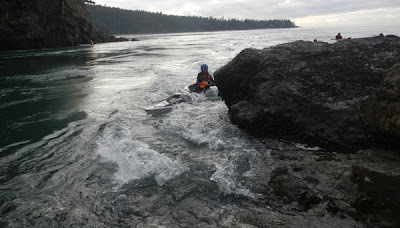 We spent the better part of the day here, practicing eddy turns and ferries as well as rescues in the current. As the current built, so did whirlpools and overfalls downstream. We tried to ride the upstream tails of the whirlpools to reattain lost ground, and sometimes just rode them around in circles. Shawna spins on the eddyline. 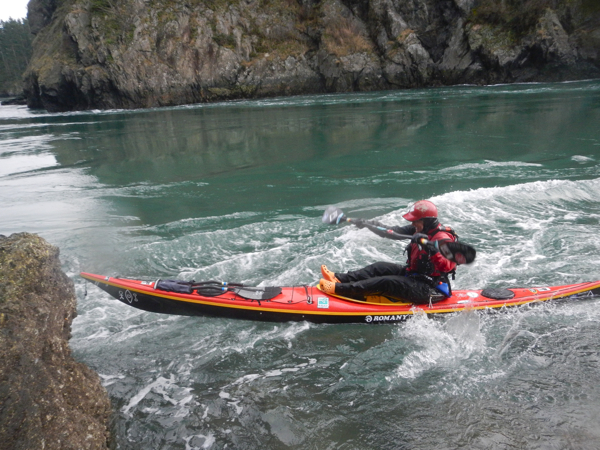 Seth uses a crossbow rudder to turn as he reaches the green water. Sharon rides the wave at the top of the eddy. Leon executes the "deep diggity dig." We spent most of the day in this one spot. 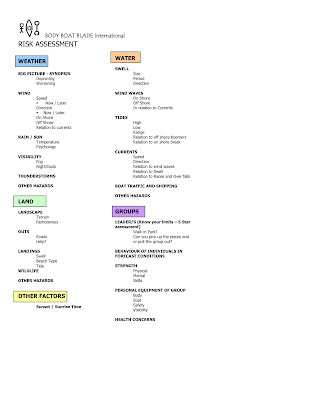 As the current diminished, the features changed. Eventually it was time to return to our cars, load up and head for Anacortes, the town with the ferry dock and plenty of pubs. Back at the beach at the end of the day. There's a quote from Isak Dinesen in the Body Boat Blade shop: "The cure for everything is salt water...sweat, tears, or the sea." As we traveled back to Orcas in the dark, we felt cured indeed. Facility closed; lake wide open. Yesterday, we met our friend Keith Wikle at Portage, Ind. 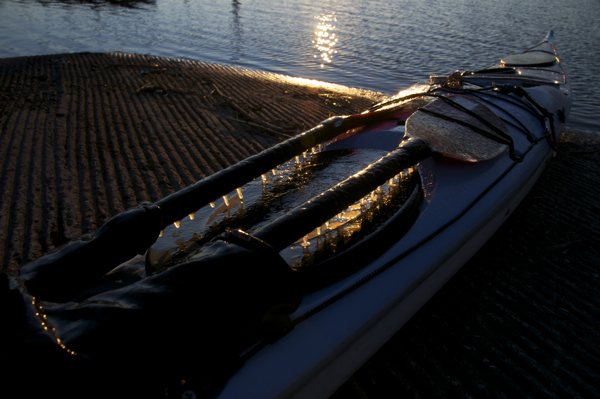 for a paddle along a portion of Indiana's notorious heavy industrial shoreline. The air was below 20 degrees and the winds were forecast to remain 15 to 20 knots out of the southwest, so we dressed and planned accordingly. Our kit reflected a sense of caution. 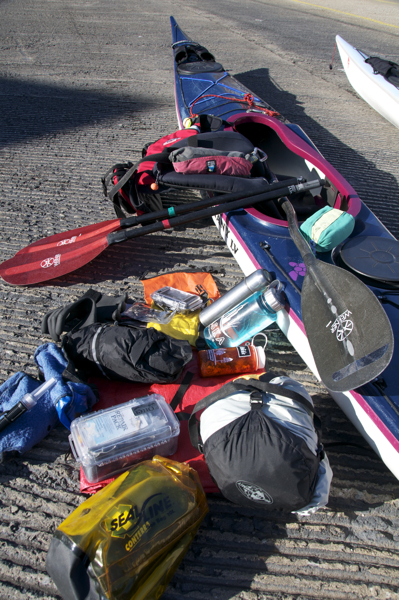 Cold-weather kit includes items we always carry -- food, water, first aid, boat repair, cag, blanket, VHF radio, cell phone, spare paddle -- as well as tea, hot water, spare clothing, emergency shelter, pogies, and a deck light. 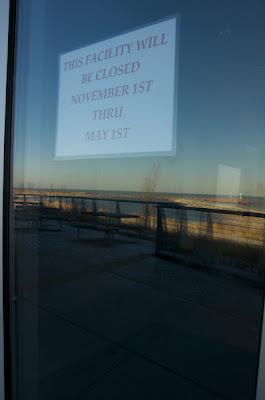 Nonetheless, we questioned how long we'd stay on the lake. 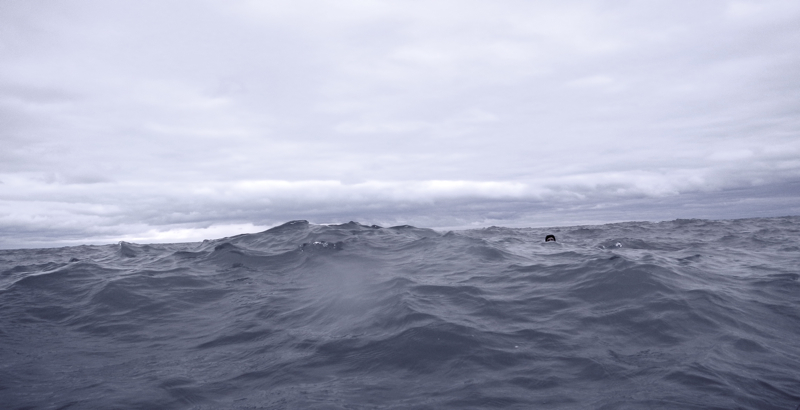 We felt the cold through our drysuits and thermal layers, and it was nearly impossible to keep our toes warm. 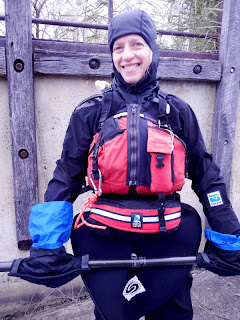 After assessing the risks and doing a calorie-to-fun calculation--a mode of decision-making we learned from Scott Fairty of Geneva Kayak Center--we got on the water and paddled out onto the lake. As soon as we were moving, we kept warm. The winds were more or less at our backs, so we planned to turn around less than half way through our four or so hours of time on the water. The rocky breakwall was just beginning to ice over for the winter. Rock meets ice meets water. 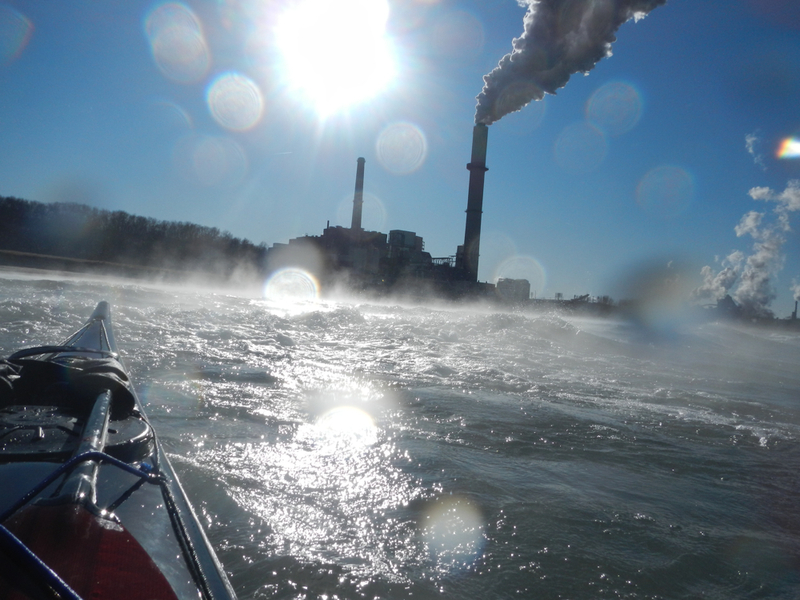 We reached the power plant just west of the Indiana Dunes National Lakeshore, where the warm water outflow raised the temperature of the nearshore water from the high 30s to what felt like about 70 degrees. Steam rose eerily from the surface. Steam rising where warm water from the power plant meets cold air. 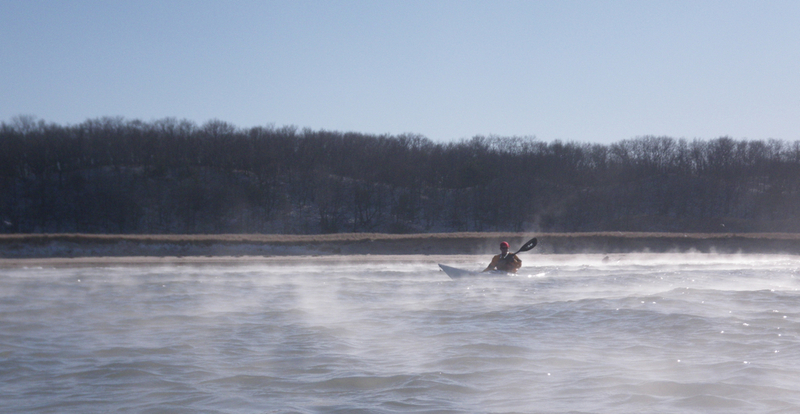 A few wave sets rolled in, allowing us a rare warm-water surfing opportunity on an otherwise cold day and lake. Keith paddles back out after a ride to the shore. We turned around here, expecting a longer trip back to Portage. The winds had picked up, gusting now to 26 knots. 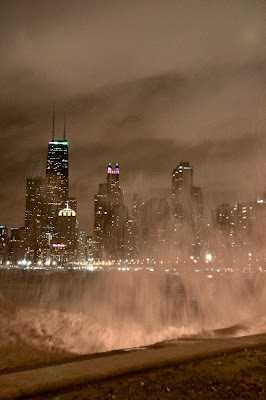 Although the air temperature was at its peak -- about 23 degrees -- the wind chill was about 10 degrees, and we felt it. 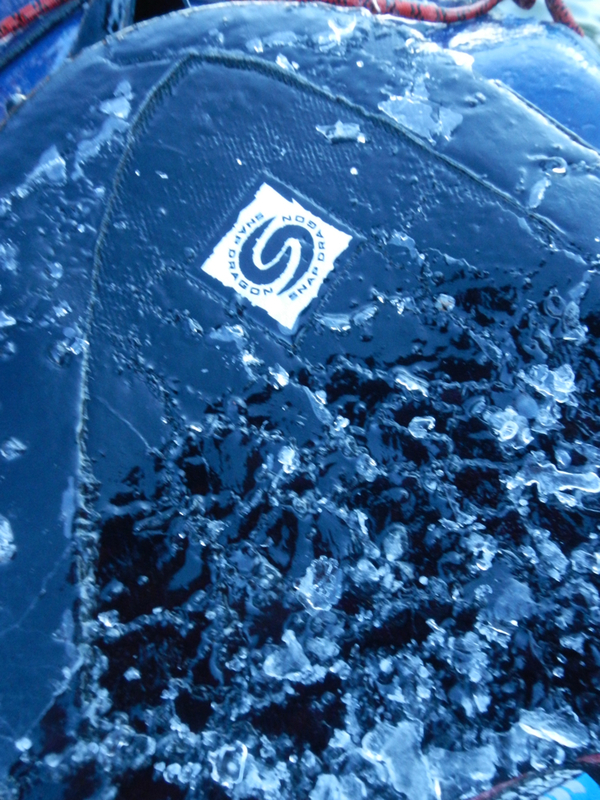 Our gear began to ice up. Our spare paddle blades, short tow and deck lines, and spray skirts were coated with ice. Icicles hung from our hat brims; ice clumps dotted our drysuits. Things that were formerly pliable became stiff. We were confident in these conditions, but we talked about how hard it would be to execute an efficient rescue with our slippery boats, chilly fingers and ice-encrusted safety gear. Things that are usually pliable, like this neoprene spray skirt, were stiff with ice. The final stretch was less than pleasant. The wind had picked up; the sun was lower on the horizon; the wind chill made it feel as though the temperature had dropped. 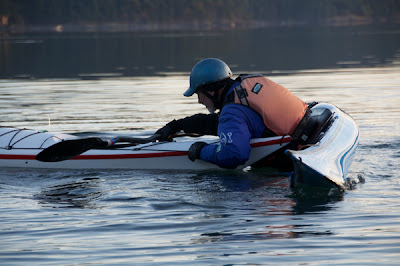 We were determined to get off the water before dark, and we knew we would feel even colder if we stopped paddling hard. Dry land and cold fingers. Over dinner, we reflected on our day. We were glad we went out. The lake was beautiful. We had assessed the risks and planned accordingly, allowing us to push our limits without getting into trouble. 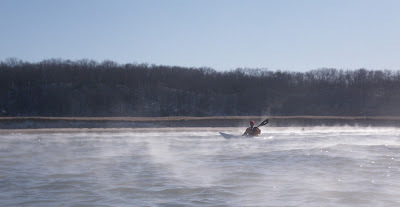 But we decided this was as cold as it would be safe for us to paddle. 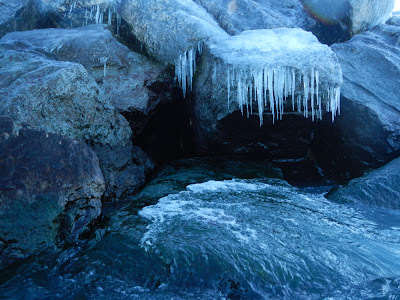 Between the hazard of hypothermia and the difficulty of doing otherwise simple rescues, even benign conditions are potentially hazardous when the weather gets this cold. 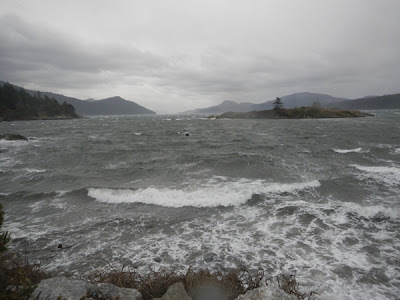 Steady north winds peaking at 50 knots generated huge waves yesterday. 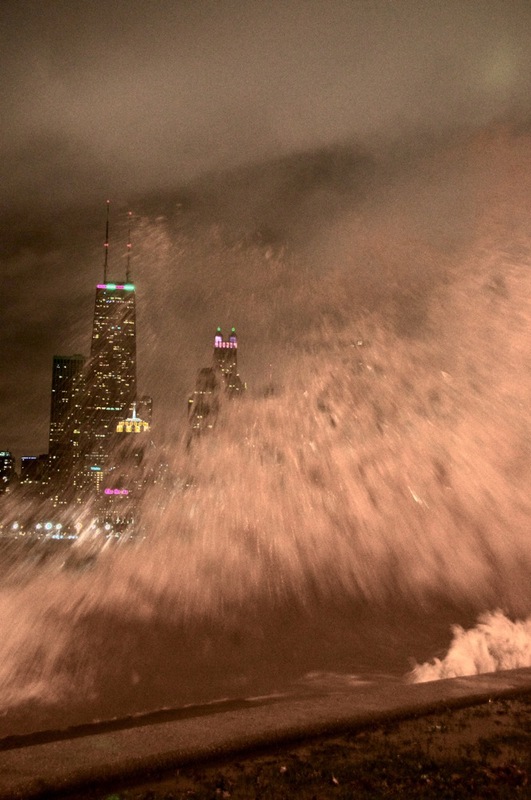 The city closed miles of the lakefront bike path, and the park district deployed vans to discourage gawkers from getting too close to the water. 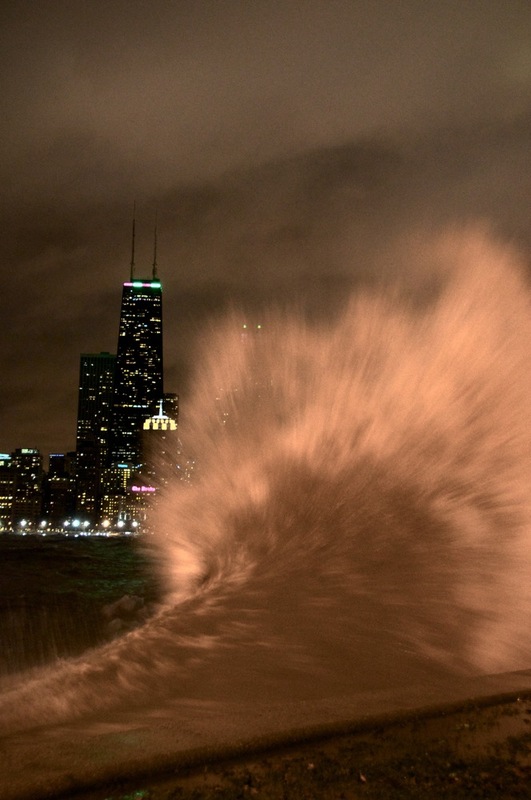 The marine forecast promised waves of 15 to 20 feet . We got just close enough to get these after-dark shots. Lake Michigan waves colliding with Promontory Point. 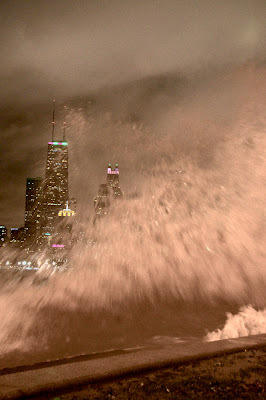 As the air and water get cooler and the days get shorter, we get more comments of the "you're so brave" and "be careful" sort as we unload our boats and prepare to paddle on Lake Michigan. Sharon dressed for the day. Is it actually riskier, or does it just feel that way? In one way, it's objectively safer: there isn't any boat traffic. We have the lake to ourselves. Sure, there's nobody on the lake to help if we need assistance, but we're happy to see empty harbors and nothing but water all the way to the horizon. In some ways, we're safer knowing that we're relying only on ourselves and assessing the risks accordingly. 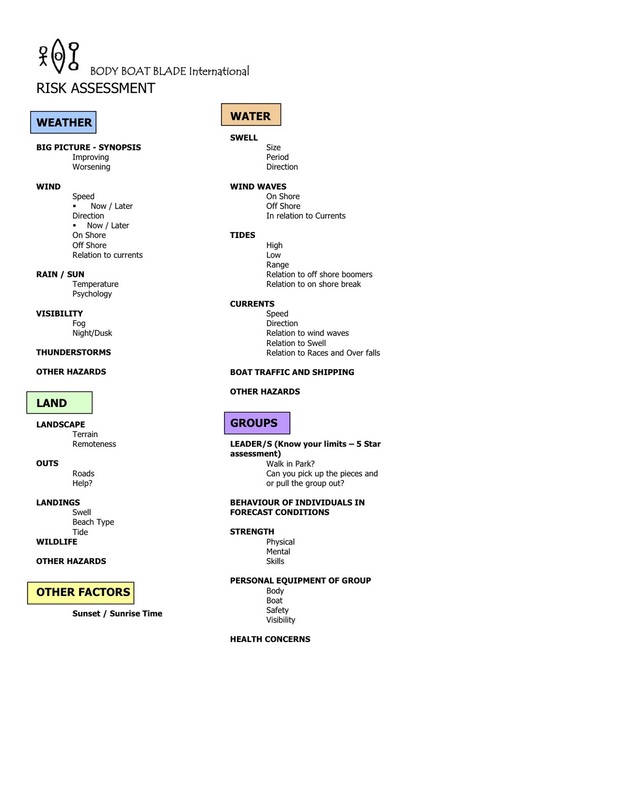 Before setting out on a recent morning, we deliberately assessed the potential risks and our preparedness. There are many good tools for doing this. Our favorite was developed by Shawna Franklin and Leon Somme of Body Boat Blade, and is helpfully posted by Keith Wikle at GoKayakNow. Here is how we employed this framework on a cold, somewhat windy day in late November. Wind: 15 to 25 knots, and not predicted to increase. Out of the northwest and predicted to shift to the north. Along shore, not off-shore, and shifting on-shore. Rain/sun: Overcast with possible rain. Other hazards: Cooler temperatures (high in the mid-40s). Landscape: Mostly hard shoreline causing reflected waves (clapotis). Outs: Several beaches and harbors along the way. 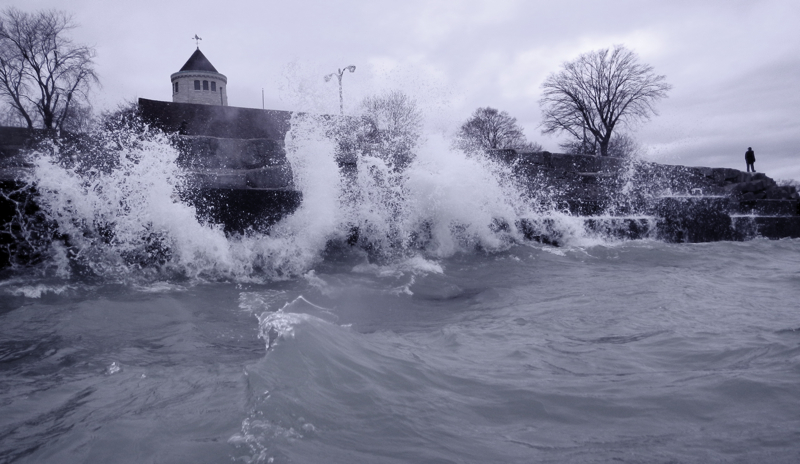 Landings: Small spilling surf at beaches or easy harbor take-outs. Wildlife and other hazards: None. Waves: 3 to 5 feet from the north. Physical strength: Good, but Sharon just had oral surgery and was feeling low energy. Mental strength: Good, with the same qualification. Equipment: Both of our sea kayaks were in good condition, as were our paddles and spare paddles. We carried boat repair and first aid kits, rescue equipment, spare clothing, communication and signaling devices, food and water, and hot beverages. Visibility was good. Health concerns: Only as noted above. Suitability of group to conditions: Well within our comfort zone. It can appear time-consuming, but after a while the process of assessing, deciding and packing becomes efficient. 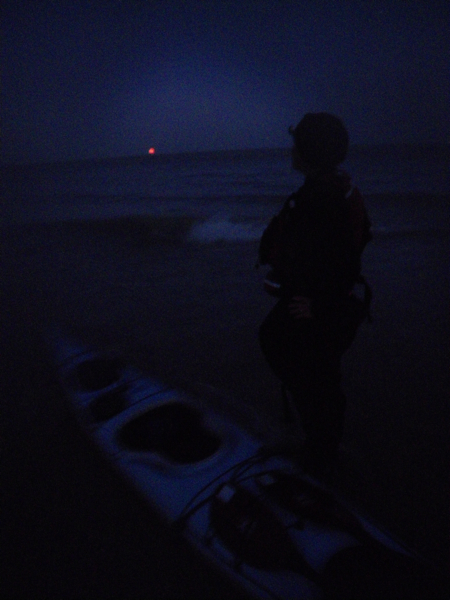 We began the assessment at home, where we checked the weather and chose where to paddle partly on the basis of it. 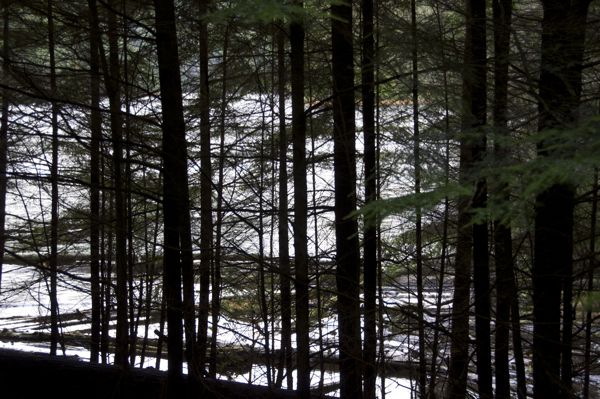 When we arrived, we looked at the lake and determined that it did not alter our plans. We decided who was bringing what as we packed our boats. And then on the water, we reassessed how we felt that day. This kind of dynamic assessment helps ensure that your assessment keeps up with changes in information and conditions. Sharon is out there somewhere. It gets dark early these days. KeelEazy revisited: How did it hold up? 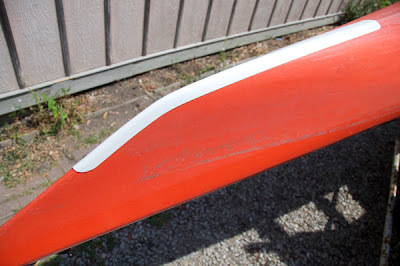 Two and a half months ago, we wrote about applying the new KeelEazy strip to one of our boats as well as to the Delphin, a plastic boat in the Geneva Kayak fleet. We found it was quicker and easier to apply than a traditional fiberglass keel strip, and we promised to report back later in the season. Alec, pulling his boat up on a break wall. 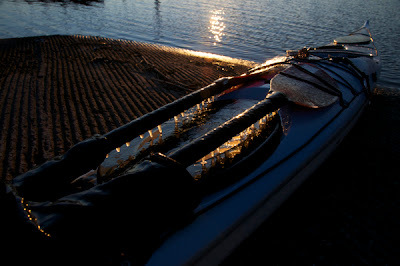 We don't primarily paddle in a rocky or barnacle-encrusted environment, but we don't baby our boats, either. We land on sand and gravel beaches, pull out boats up on rocky break walls, and travel to places where we do a little rock gardening. 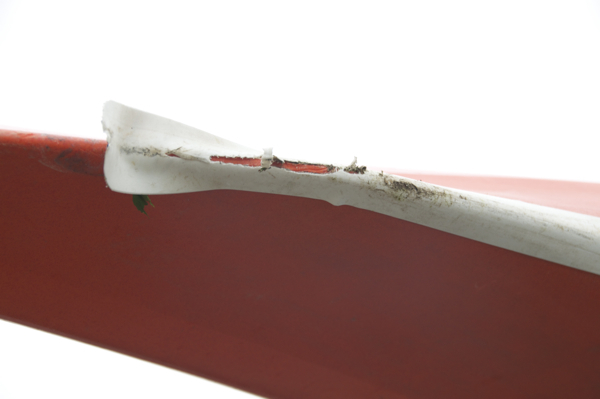 That's why we are interested in having keel strips on our boats; they offer needed protection. 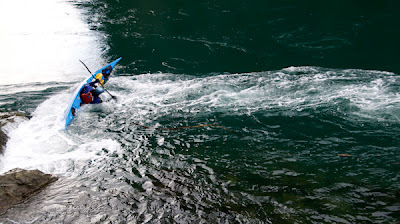 We can't completely account for the abuse that the Delphin endured over the past couple of months, but it was definitely paddled on the Yorkville whitewater course. How did they hold up? The strip on Alec's composite boat has done pretty well. It peeled a little bit in the area that had to be cut out to accommodate the skeg, and it buckled a little bit on the rocker in the stern. (As we wrote in the original post, the weather was very warm--above 90 degrees; the ideal temperature for applying it is 70 degrees.) The areas where it peeled or buckled attracts small pebbles. But it has protected the keel and hasn't peeled at either end. It's gotten a little scratched and gouged, but it has held up admirably. The area where the KeelEazy had to be cut around the skeg peeled a bit and attracted sand and pebbles. Although the KeelEazy buckled near the stern, the wear on the strip was comparable to the wear on Sharon's fiberglass keel strip. We applied the extra length to the keel of a Delphin in the GKC rental fleet. If your boat has a tight radius on the stem (the portion of the keel where the boat curves up toward the deck), the strip may buckle. In that case, cut it and fold the flap over; you can use a drop of Super Glue if necessary to adhere it. 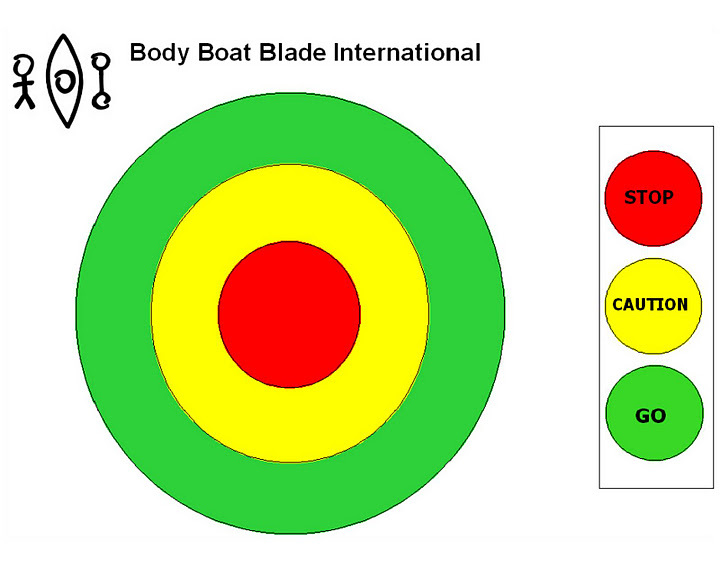 Plastic boats will generally accept the KeelEazy well, provided they don't endure serious abuse. He's put strips on the bow and stern of whitewater boats to protect them, too. 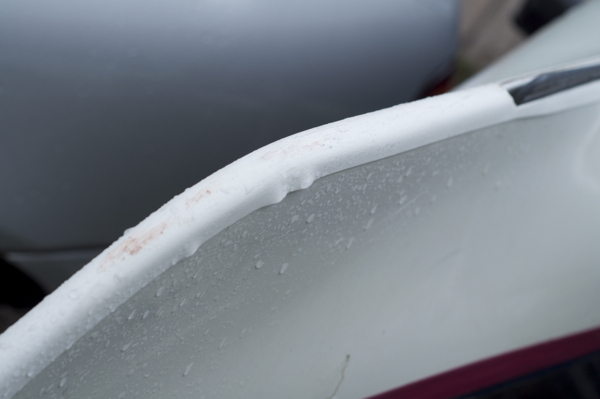 It's a good idea to use a solvent to clean any boat prior to installation; alcohol (which we used on our composite boat) or acetone (one plastic) work well. Mineral spirits will leave a residue. Because KeelEazy is a thermal plastic, avoid stretching it too much in the heat because it will seek to return to its previous shape when it cools. 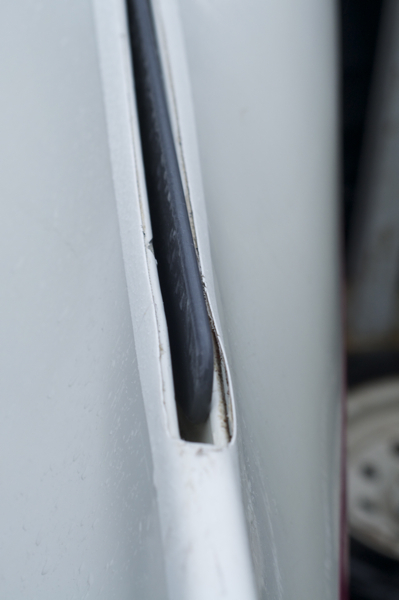 If you have trouble with a section -- as we did with the skeg area -- try cutting that section out and replacing it before you replace the entire strip. So what do we think? If you aren't willing to spend the time to apply a fiberglass keel strip, which is a significantly messier process, the KeelEazy is a good option. It really takes only 15 minutes and no special tools. In the two-and-a-half months we tested it, it proved as durable as a traditional keel strip. Either can be damaged, of course. A traditional keel strip can then be repaired; the KeelEazy can be removed and replaced. 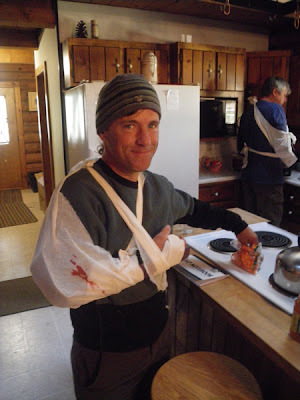 Alec just returned from a four-day Wilderness Advanced First Aid class, offered by Rutabaga and attended by 20 paddling instructors, guides and other people who work in outdoor recreation, particularly with kids. 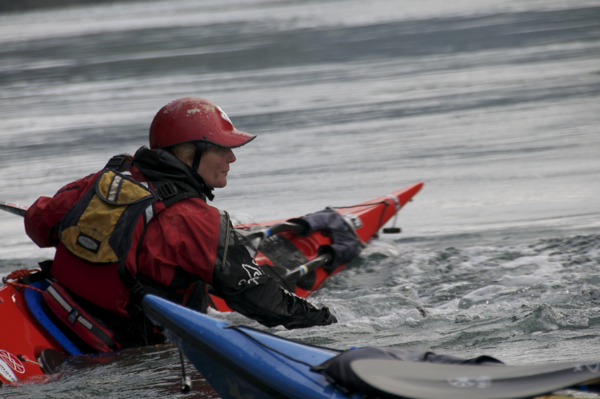 This is follow-up course to the basic two-day Wilderness First Aid course many of us take to meet the requirement for maintaining certification as an American Canoe Association instructor. It can also be used as a recertification for Wilderness First Responders, of whom there were eight in this course, or as the first step toward becoming a Wilderness First Responder (the next being the four-day Bridge course). Like other training and certification programs we've undergone, each of these first aid courses raises participants' level of skill and scope of practice (or remit). 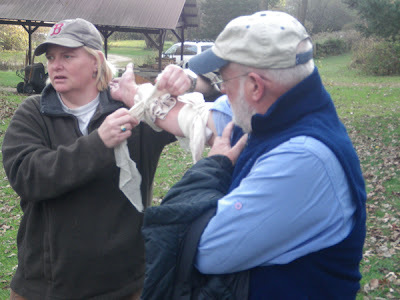 Wilderness First Aid teaches basic skills for diagnosing and treating maladies we might encounter; Wilderness Advanced First Aid provides more depth and breadth for people with a higher level of responsibility for groups of people on longer trips into more remote areas. Wilderness Medical Associates lead instructor Sawyer Alberi places a tornaquet on assistant instructor John Browning. The course teaches patient assessment, a system that guides the process of diagnosing and making decisions about treating people who are ill or injured. It also teaches CPR, interventions (treatments), and procedures for stabilizing and evacuating patients. There are some classroom lectures and discussions, but the emphasis is on learning through experience by means of carefully designed scenarios. 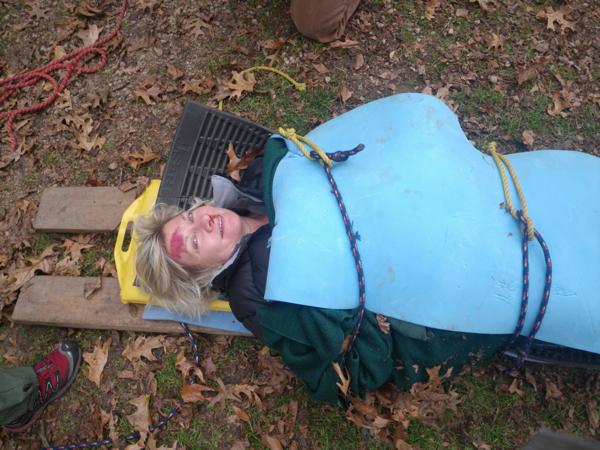 Mary, stabilized and ready fora helicopter evacuation after a mountaineering incident. Trainings like these cost money and take time, but they're well worth it. The knowledge we gain helps us prevent some incidents and handle others if they arise. We hope to do more of the former and less of the latter. 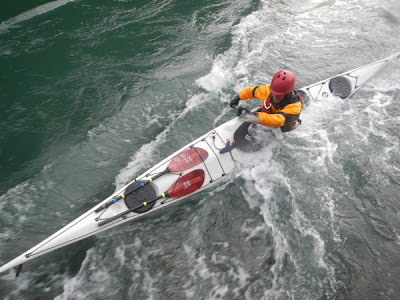 Many paddlers make a false distinction between flat-water and rough-water skills. They practice maneuvers in calm conditions that would never work in dynamic water, thinking they will learn "advanced" skills for more challenging conditions. Dave Olson puts boat handling skills and timing to the test. This past weekend at The Gales Storm Gathering, participants discovered that there are no such things as advanced skills. There are simply solid skills applied to advanced conditions. 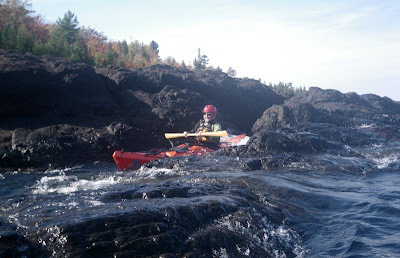 Leon applies his tidal race skills to the Menomenee currents. The wind, waves, current and rocks put everything to the test. 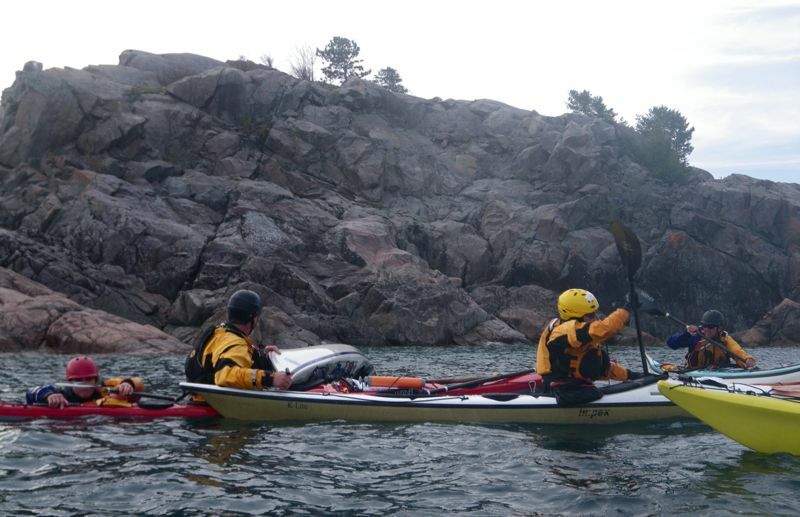 If a rescuer didn't hold on tight to a swimmer's boat, the wind swept it away. 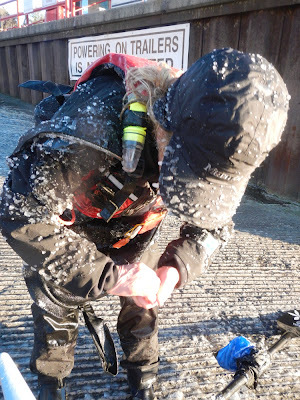 If a bow rudder wasn't effective, a rock was decorated with gel coat. 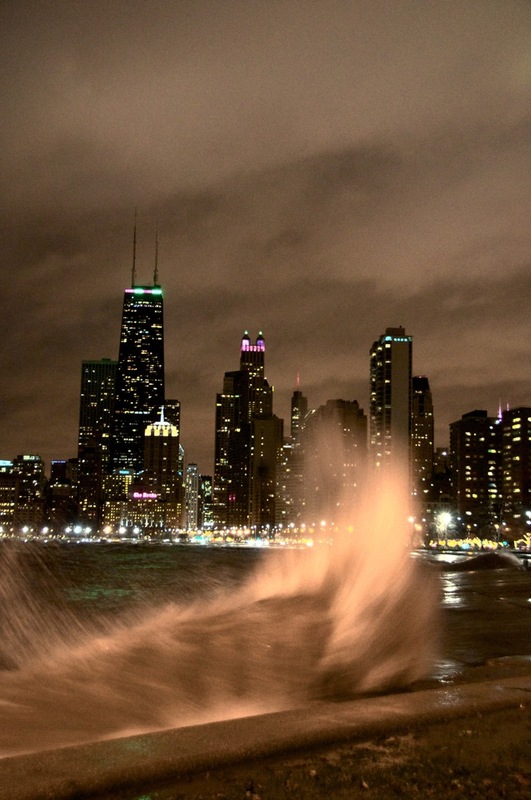 Choosing the wrong edge in current led to immediate feedback from the river. 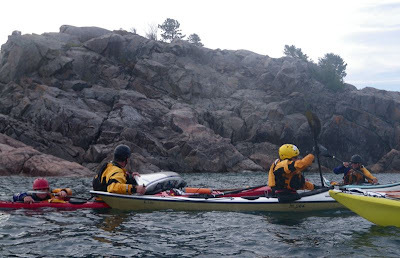 Incident management has urgency if you are drifting towards rocks. 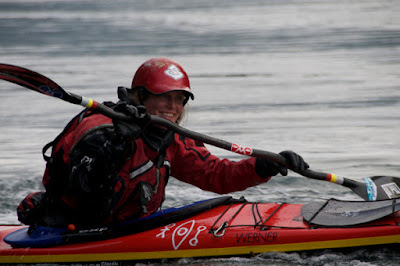 As Shawna and Leon told us, a five-star paddler is just applying three-star skills in five-star conditions.